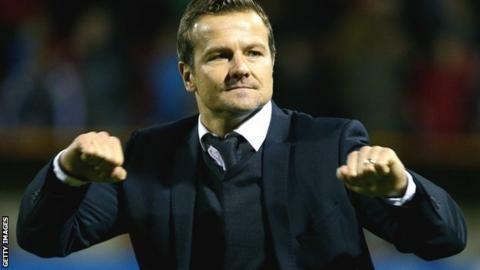 Swindon Town have rejected an approach from Barnsley for manager Mark Cooper. BBC Wiltshire understands the Tykes want Cooper to replace Danny Wilson, who was sacked last week. The 46-year-old took over at the County Ground in the summer of 2013 and has guided the team to second place in League One this season after finishing eighth last term. Cooper previously managed Kettering Town, Peterborough United and Darlington. The Oakwell side, who have declined to comment on the story, are 19th in League One, only five points clear of the relegation zone. They are currently under the caretaker manager of coaches Mark Burton and Paul Heckingbottom, but lost 5-1 at struggling Crawley on Saturday. Plymouth boss John Sheridan played down speculation linking him with the vacancy on Monday.